NORTHERN TERRITORY, AUSTRALIA – Iowa State’s PrISUm Solar Car team kicked off the 2017 Bridgestone World Solar Challenge by driving 380 kilometers from Darwin to south of Katherine. Sean Collins, the team’s Aerodynamics Manager, drove the first leg of the race. The junior aerospace engineering major said he was able to utilize the information the team learned during dynamic scrutineering coupled with skills he developed practicing on the Hidden Valley Raceway in Darwin during the days leading up to the race. “In the days leading up to the race we did a lot of driving and testing with the car to get us drivers acclimated to driving as efficiently as possible. Knowing the different noises the car makes and how the wheels track down the road allowed me to keep the car on the road for as long as possible,” said the Sun Prairie, Wisc.-native. The day – which was partly cloudy at times — wasn’t without its challenges as this particular stretch of Northern Australia is among the hilliest terrain of the race. “Hills pose the most inefficient driving scenario for any vehicle, and can make or break a solar car team’s strategy” said Matt Goode, the team’s Race Manager and a senior in materials engineering. 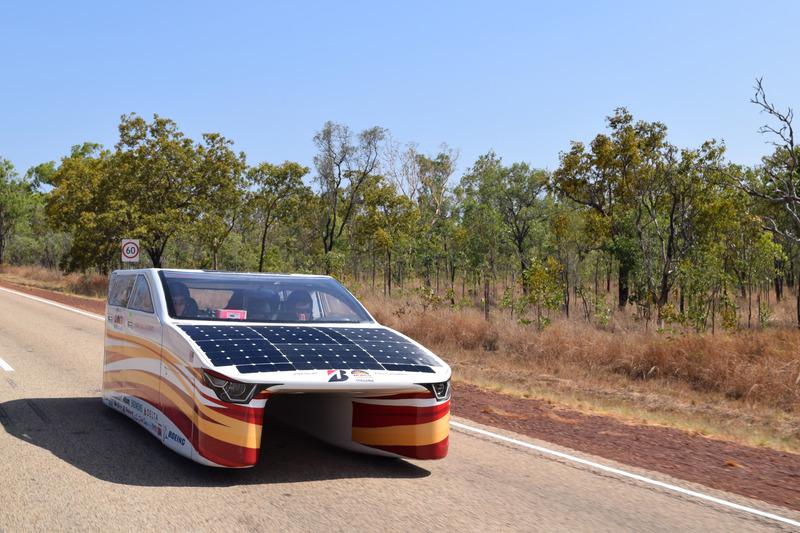 Roughly 200-kilometers into the race, the team came upon a stalled solar car along the side of the road, which requires quick action from Collins. 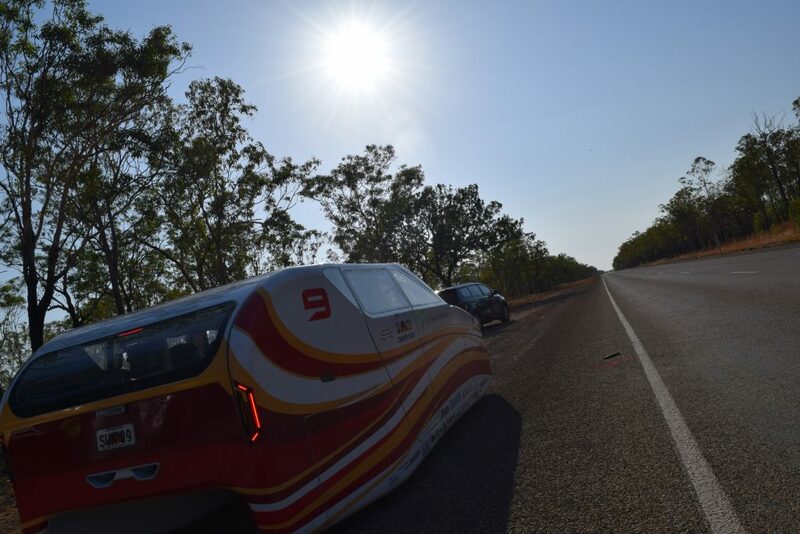 The team experienced some more adversity when they encountered battery issues shortly after the first controlled stop in Katherine, roughly 317 miles south of Darwin. “Today we tested Penumbra’s efficiency on annew and untested road. The hills coupled with the start and stop driving of Darwin caused for a large amount of energy to be dissipated” said Goode, a materials engineering major from Coggon, Iowa. However after a brief charge, the team was able to get back on the road to drive to their first rest stop of the race, where the team camped out beneath a clear, starry sky. 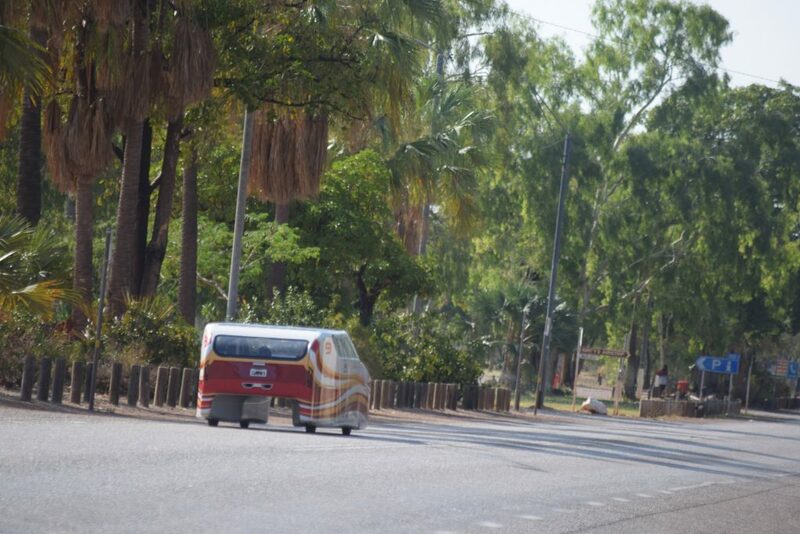 “The Bridgestone World Solar Challenge is truly living up to its name. The team has been challenged but we have adjusted our race strategy to compensate. Tomorrow we will continue to race around 70 kilometers per hour which should average to about 500 kilometers per day,” Goode said. The Bridgestone World Solar Challenge is a 3021-kilometer biennial race that begins in Darwin in Australia’s Northern Territory on October 8 and finishes in Adelaide in Southern Australia on the 15th. 2017 marks the race’s 30th year and features 42 teams from more than a dozen countries. You look amazing out there! So proud of our boy-Sean Collins and his team mates! Wow! Isn’t that the greatest stuff, my grandson racing across Australia, way proud! Woohoo! Love hearing about all of this! Go team PrISUm! I’m so happy that companies like Bridgestone and Boing give these young people this opportunity. Go Team PrISUm! I’m so proud to be “in” this with you!